The paperback edition of L.B. 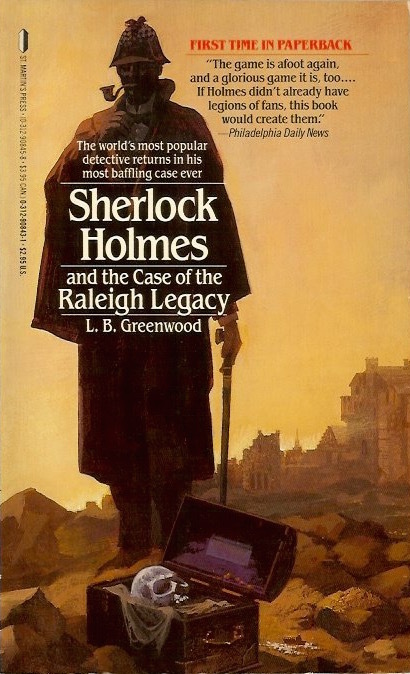 Greenwood's first Holmes pastiche. Jon L. Lellenburg said on behalf of the Conan Doyle Estate: "It is exactly the sort of faithful, straightforward, entertaining Sherlock Holmes mystery we like to see." The mystery stretched back to Sir Walter Raleigh. His cryptic letter, with its mention of a great treasure, was the only legacy young Aleck Raleigh had. And for almost three centuries every Raleigh heir had sought the treasure. Now only Aleck is left in the somber, decaying mansion of Nightsead–with his stepfather, Mr. Moseley, a gaunt man filled with suspicions and secrets. And as the mystery deepened with the appearance of a vivacious American girl and strange events at Nightsead, it was sure to end with murder...a devious, diabolical act that made this a case only the great Holmes could solve.